Val's Quilting Studio : FORE! Hubby and I have spent the last two days enjoying an extra long weekend together. We visited local golf courses and enjoyed dining in new restaurants. Warm Springs Golf Course Boise, Idaho. A change of scenery is always refreshing. 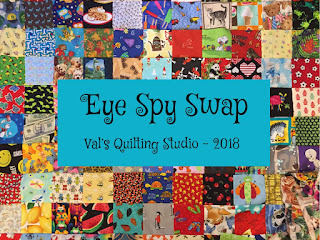 But with that said, luckily I didn't hit anyone with a golf ball, but while catching up on emails this morning I realized we have FOUR TWO ONE ZEROspots left in our Eye Spy Swap. Click HERE to read all the details and perhaps think about joining us. .Double spots are still available too. Thank you to everyone who has joined the swap. some very happy mail to look forward to at the end of the month. Stay tuned! What a very nice picture of you two. What a great picture of both of you1. Enjoy your weekend together. Sounds like a very fun weekend. Looks like your summer break is off to a fun start! Sweet photo of you and your husband. Looks like Summer is agreeing with you, Val.